When it comes to home theater installation our main aim is to provide you with the sharpest images and richest sound whilst maintaining ease of use. All our home theater installation technicians are fully trained and must comply with a strict code of experience in all areas of home theater products and installations. We can install a complete home theater system for you, or integrate your new Audio/Video purchase with your existing equipment. Our installation process includes special consideration to correctly position speakers in along with the correct use of cabling that will best suit the overall system being installed. 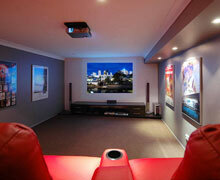 Years of installation experience with the knowledge of the latest in home entertainment ideas, can help you create that fantastic home theater experience in many ways without blowing a tight budget, by recommending a good value home theater package or proposing an economic and efficient upgrade of your existing HiFi and home theater equipment. "These people did really tremendous job and my family will certainly recommend them to our friends."